Bison at the National Animal Disease Center in Ames, Iowa, are helping scientists find better ways to immunize wildlife against disease. Researchers at ARS’s National Animal Disease Center (NADC) in Ames, Iowa, have been taking aim at bison and shooting at them from distances of up to 90 feet—all in efforts to make the bison healthier! Actually, it’s part of a ballistic approach to vaccinating wildlife against brucellosis, an infectious disease of both animals and humans that’s especially feared by cattle producers. Specifically, the scientists—veterinary medical officer Steven Olsen, of NADC’s Bacterial Diseases of Livestock Research Unit, and chemistry professor David W. Grainger and graduate student Jim Christie, of Colorado State University’s chemistry department in Fort Collins—are seeking better ways to remotely inject free-ranging bison with RB51, the most effective vaccine available against brucellosis in cattle. 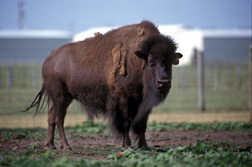 Research on immunizing bison, elk, and other animals in the wild against Brucella abortus, the microbe that causes brucellosis, is essential to agriculture because cattle can get the disease through close contact with infected wildlife. Brucellosis is an incurable infection that in animals induces abortions, decreases fertility, and reduces milk production. Its bacteria can also be transmitted to humans—through contact with infected animals or consumption of unpasteurized dairy products—and cause undulant fever, an affliction characterized by severe flulike symptoms. A problem for cattle ranchers since the 1840s, brucellosis has been nearly eradicated in this country, mostly through cooperative federal and state programs begun in 1934. But its spread through wildlife has rekindled concerns in cattle producers, who suffer severe economic losses when their herds are infected. Although ballistic vaccination isn’t new, this recent work involves testing a new version of a biodegradable projectile. Developed and trademarked under the name “Biobullet,” by Solidtech Animal Health, Inc., of Newcastle, Oklahoma, it has a hollow chamber that can be filled with vaccine incorporated into a pellet. The vaccine-packed bullet is fired into the animal’s muscle tissues, mainly in the legs. The vaccine is released, and the casing later dissolves inside the animal. A new method of preparing the vaccine pellet—developed at Colorado State and tested at NADC—places the RB51 into a gel rather than a compressed pellet. The gel protects the live bacteria in the vaccine, perhaps making it more effective, says Olsen. The National Park Service is conducting an environmental impact study to gauge whether this new projectile can be used in Yellowstone National Park to vaccinate free-ranging bison against brucellosis. This research was published in the February 27, 2006, issue of Vaccine.—By Luis Pons, Agricultural Research Service Information Staff. Steven C. Olsen is with the USDA-ARS National Animal Disease Center, 2300 Dayton Rd., Ames, IA 50010; phone (515) 663-7230, fax (515) 663-7458. "Goin’ Ballistic Against Brucellosis" was published in the June 2006 issue of Agricultural Research magazine.